From the first time I saw the trailer for A Wrinkle In Time, I knew this was a movie I needed to see. I’m attracted to visually appealing things, and this movie seemed like a feast for the eyes. I caught an advanced screening this week and I can tell you that it did not disappoint! The movie opens with Dr. Alex Murry (Chris Pine) and his daughter, Meg (Storm Reid), conducting an experiment together. We soon learn that Alex and his wife, Dr. Kate Murry (Gugu Mbatha-Raw), are scientists who are studying the physics of inter-dimensional travel. One night, Alex stumbles upon the answer he’s been looking for, but he gets lost in time. Fast-forward four years later, and his kids are dealing with the fallout of him being gone. Life isn’t easy for Meg and her little brother Charles Wallace, who can’t understand why their dad left. But one day everything changes when a celestial being named Mrs. Whatsit (Reese Witherspoon) arrives unexpectedly at their house and tells Kate and her kids that she wants them to know there IS such a thing as a tesseract (the wrinkle in time that Kate and Alex had hypothesized; it’s the fifth dimension that can shorten the distances across space and time). Soon the kids are introduced to the Mrs. trifecta – Mrs. Whatsit is joined by Mrs. Who (Mindy Kaling) and Mrs. Which (Oprah Winfrey) – who tell them that they’ve heard Alex’s call across the universes and that the kids are needed to help find him. Along with their friend Calvin, they embark on a magical and mysterious journey to new worlds, including one full of dark energy, called “The It”. 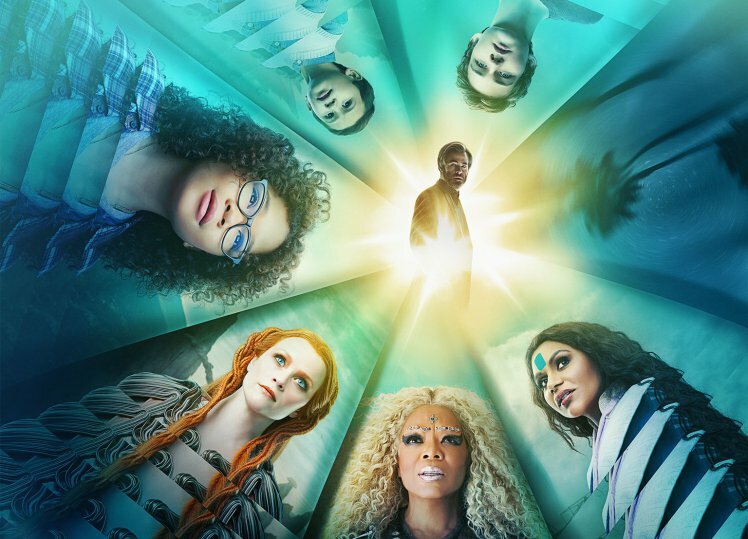 A Wrinkle In Time is visually stunning, transporting the viewer to a different time and place with authenticity and emotion. The power of courage, perseverance, love and self-acceptance are messages that are woven deep into the fabric of this movie, making it a great choice for families to watch together. Despite a slightly disjointed story – there are some unanswered questions and minor story gaps that we’re only given clues about – the overarching themes of empowerment and faith in oneself ring true. This is, after all, a fantasy movie… it’s okay that not every detail is explained in full; the viewer’s imagination can fill in the blanks. Here’s the thing – to me, a movie is successful if it’s interesting (visuals and storyline) and stirs the viewer’s emotions. This movie delivers on all counts, for me. It goes without saying that the costumes and visual scenery are gorgeous. As for the acting, I empathized with Meg’s inner turmoil about her dad’s absence; she loves him, yet is angry at him for leaving her, which affects her self-confidence and ability to trust others. Her younger brother, unfettered by the same emotional baggage (he was a baby when his dad disappeared), has an open mind about the otherworldly adventure, and he helps his sister believe in the unbelievable. It showcases the power of family and faith in each other. There are lots of inspiring messages along the way, too. I’ll be taking my kids to see this movie because I love the strong, positive messages it imparts. And also because I know they would love the visuals as much as I did! A Wrinkle In Time is rated PG (in Canada) for some scary scenes, some of which are a bit creepy. I personally don’t think there is anything extremely jarring about this movie, so I’d recommend it for 8+. As always, you know your child best. Great review!! Thank you for the heads up on the scary scenes, last thing I need is 5-6 screaming scared little ladies!! You’re welcome, Darlene! I’m glad you found it helpful.